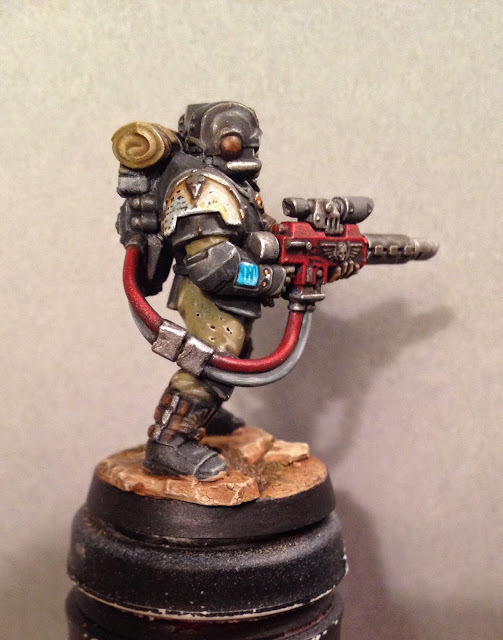 Here's the test model for my first squad of inquisitorial stormtroopers (or militarium tempestus or whatever). I put the other four together today and will start painting them this week so if you have any suggestions visavi paintscheme let me know! 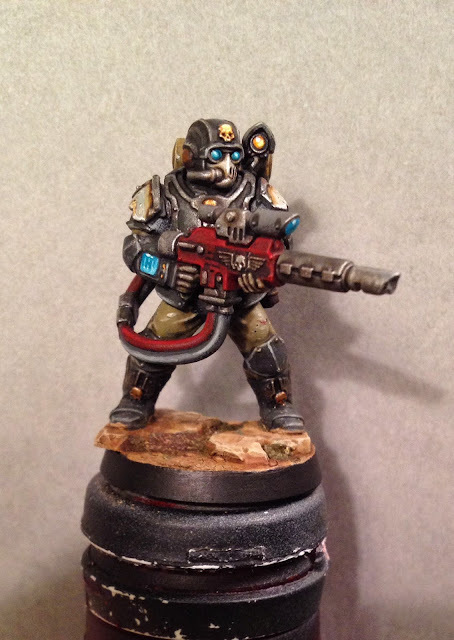 Here´s a quick guide to how I painted him. Bone: Zandri dust washed with seraphim sepia, Highlighted with celestra grey and skull white. Red: Mephiston red mixed with black, washed with agrax earthshade and highlighted with mephiston red. The cyan/blue/turquise is an army painter paint whose name eludes me at the moment but it´s probably pretty similar to sotek green. Highlight by adding white to the original paint. That is a very nice colour scheme you've got there. Any chance you could spill the beans on how you painted this chap, please? No problem! 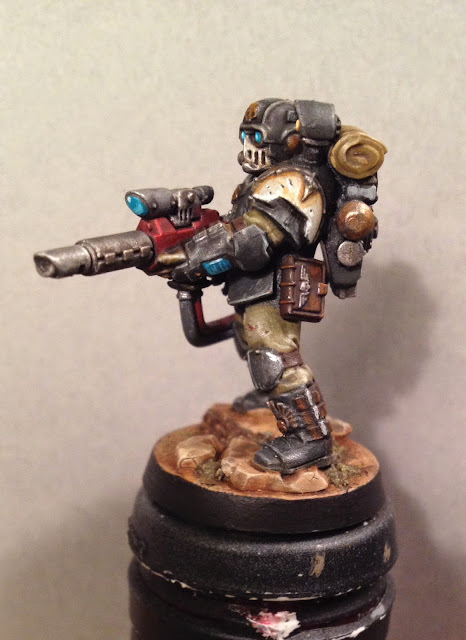 I´ll add a walkthough on how he´s painted. Oh yeah - that guys is all sorts of win - that scheme rocks Jeff - total badass - The black/grey armour goes awesomely with the green legs. Echoing the above - paint recipes please! That is a beautiful turquoise, love the tiny data lines flowing across the screen on his wrist. No constructive criticism I'm afraid, just praise! I meant how easy is the kit itself to de-Imperialize? I didn't mean to change what you've done at all! I think they already look pretty evil - the armour is really cool and I´m glad GW has brought some gothic wierdness to the IG. That said, one of my reservations about the kit is that it´s almost TOO baroque for a standard imperial unit, bordering on chaos baroque. They should in other words be fairly easy to turn into servants of the dark gods. Looks great! Might make me change my mind on picking up a box or two. I particularly like your color choices and the work on the shoulder pads. Nice work, although I think that the color of the shoulder pads is a bit "bright" and might work better with a metalic paint as the armor... then you could use black writing, sort of like you see stenciled on airplanes. Yeah - I agree. I'll paint the shoulder pads grey on the next four and see how that looks. I also find them a bit too bright. Maybe do the stripes just on the volley gun? That would be a nice way to mark it out a bit more. I accidentally used the arms for the volley gun on this first one... You have to read the fine print in these new kits. I gotta say I´ve loved them from the start. The only thing that bugged me in the initial pictures was that the arms seemed a bit ape-like, but with the models in hand that´s not an issue. He looks class really a top job. Stunning model. As you show, these models have so much potential for so many things. I agree - the modelling potential is pretty staggering. 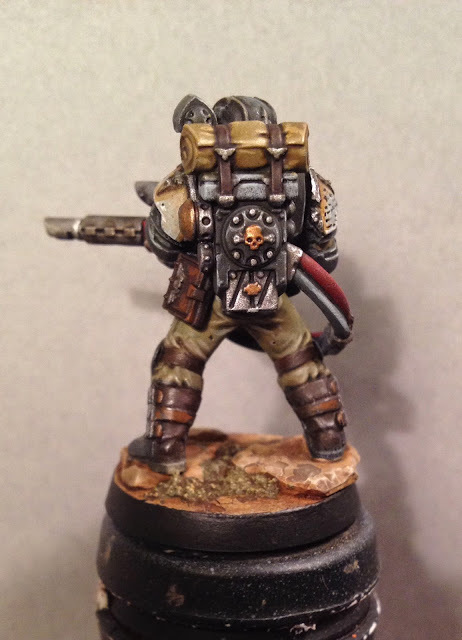 I´ve barely done any converting on these first five except changing the chainsaw laspistol to the sergeants left hand and snipped off the antennas.